The flavours of cabbage rolls without all the work is what you’ll find in this unstuffed cabbage roll casserole freezer meal. With the same ingredients as traditional cabbage rolls, this freezer meal recipe is simple to prepare and will have you reminiscing about the real thing. My mom grew up in a small town in Canada with a population that was predominantly Ukrainian. Although she wasn’t Ukrainian herself, she became very accustomed to the food and culture. This led to us regularly having traditional Ukrainian food such as pyrogies, cabbage rolls and borscht when I was growing up. What may seem like unusual food to others was very commonplace for us. Once I became an adult, I introduced Ukrainian foods to my own family, but since my husband isn’t the biggest fan of cabbage rolls, it’s not worth all the work of stuffing and rolling for me. That is exactly why this lazy cabbage roll version is perfect for me. The fact that I can make it as a freezer meal and make many of these recipes at one time is an added bonus. I wasn’t sure what my kids would think of this meal because of the cabbage, but one of my sons especially loved this recipe. To blanch the cabbage, place the coarsely chopped cabbage in a pot of boiling water for 1-2 minutes before draining. Brown the ground beef. Cook the rice according to the instructions on the package. Place the blanched cabbage, the browned beef, the cooked rice and all the other ingredients in a large resealable freezer bag. Remove the excess air and seal. Freeze. On the day of cooking, take the bag out of the freezer to thaw. Dump the bag contents into a greased casserole dish or oven safe baking dish. Bake at 350° for 45 minutes. You can serve this casserole on its own or serve it along with other Ukrainian favourites such as garlic sausage, Nalysnyky, or pyrogies with sour cream and onions. 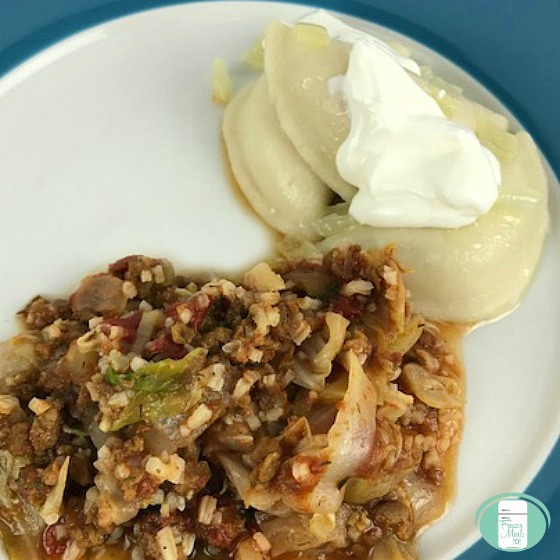 Looking for more cabbage roll inspired dishes? This Cabbage Roll Soup can be made ahead, frozen and then reheated. This recipe along with others are included in our Around the World Freezer Meal Plan which includes prep lists, printable shopping lists and printable labels. With the same ingredients as traditional cabbage rolls, this freezer meal recipe is simple to prepare and will have you reminiscing about the real thing. To blanch the cabbage, place the coarsely chopped cabbage in a pot of boiling water for 1-2 minutes before draining. Place all the ingredients into a large resealable bag. Remove the excess air and seal. On cooking day, take the bag out of the freezer to thaw on the day of cooking. Dump the bag contents into a greased casserole dish. You can serve this casserole on its own or serve it along with other Ukrainian favourites such as garlic sausage, Nalysnyky or pyrogies with sour cream and onions.